Sandstorm. Done on Sketchfu with a mouse. I have always felt sad about her relationship with Firestar, though. With spottedleaf whispering to him in his dreams all the time. Even though she died, I would imagine it hard for sandstorm.. Wallpaper and background images in the Warriors (Novel Series) club tagged: warrior cats sandstorm. Done on Sketchfu with a mouse. I have always felt sad about her relationship with Firestar, though. With spottedleaf whispering to him in his dreams all the time. Even though she died, I would imagine it hard for sandstorm. This Warriors (Novel Series) fan art might contain टॉम, बिलाव, टॉमकैट, बिल्ली का बच्चा, किटी, किट्टी, बिल्ली, सच्चे बिल्ली, and सच बिल्ली. 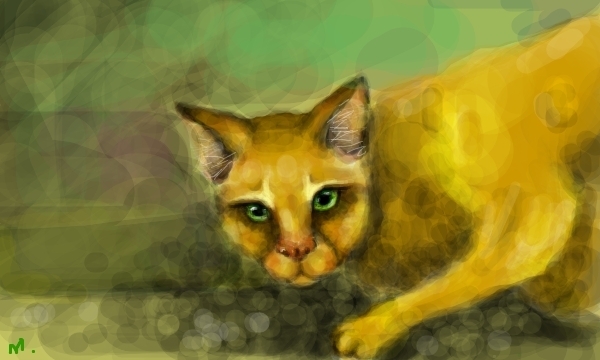 Yeah Sandstorm...I wonder if Spottedleaf still talks to Firestar...Amazing drawing by the way!! Wait...no offense....but is she PREGNANT?! yes, I wanted to have her pregnant in this pic, since hunter never mentioned her pregnancey. WOW YOU'RE AN AWESOME DRAWER!!! !